Senior Aerospace Weston is a leading supplier of a wide range of complex precision machined components and sub-assemblies, predominantly for the commercial aviation market. At the company’s machine shop in Earby, UK, 95% of output is for use in Airbus aircraft models. Most of the components are aerostructure (wing and mainframe) components including engine pylon brackets and landing gear fittings. Some of the more complex aerostructure parts were taking up to 10 minutes to inspect using Senior Aerospace Weston’s existing coordinate measuring machines (CMMs). This would often cause bottlenecks and capacity limitations around the CMMs. To address the problem, the company introduced various manual inspection methods using traditional measuring equipment and hard gauging, but to limited effect. With build-rates increasing, Senior Aerospace Weston recognized its responsibility to become even more efficient with in-cycle measurement without compromising quality. 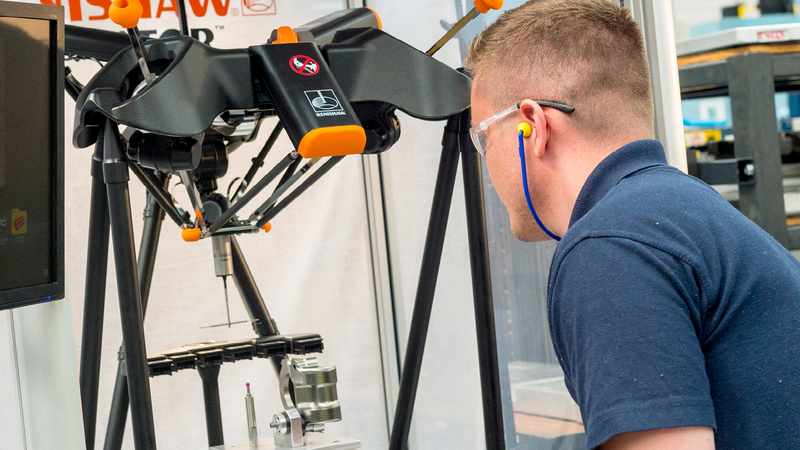 “We spoke with Renishaw and they proposed the Equator gauge, which is another level up from a traditional 3-axis CMM in terms of speed,” explains CMM Programmer Andy Wright. The thermally-insensitive Equator system is a flexible gauge that is designed to provide speed, repeatability and ease-of-use. which was installed during January 2018. Among the parts inspected at Senior Aerospace Weston using the Equator gauge is a titanium wing flap track component for Airbus aircraft.